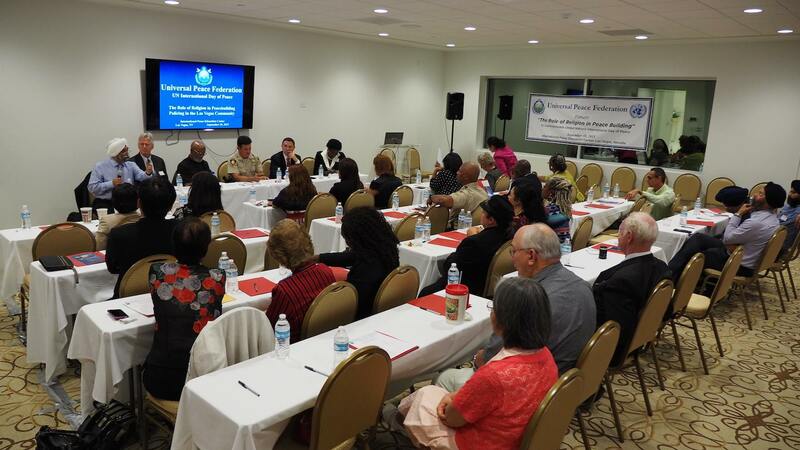 By FFWPU USA: At the newly opened International Peace Education Center, the Universal Peace Federation of Las Vegas held a forum entitled “The Role of Religion in Peacebuilding” on September 30, 2015. 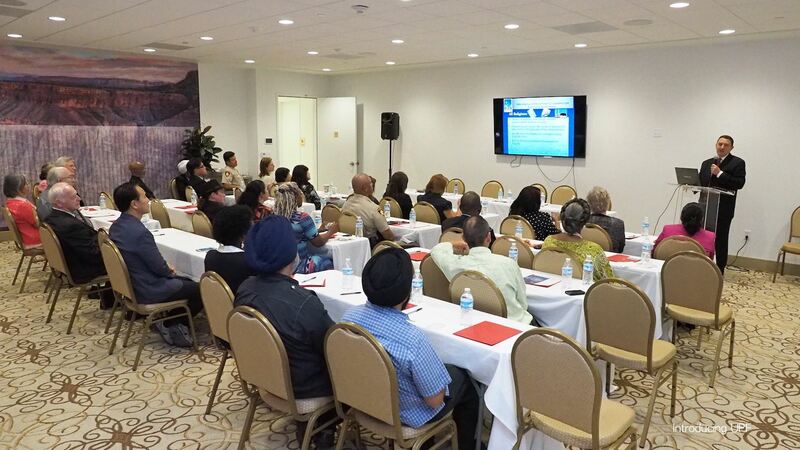 Religious leaders, government and community leaders and interested citizens from Las Vegas attended the event. 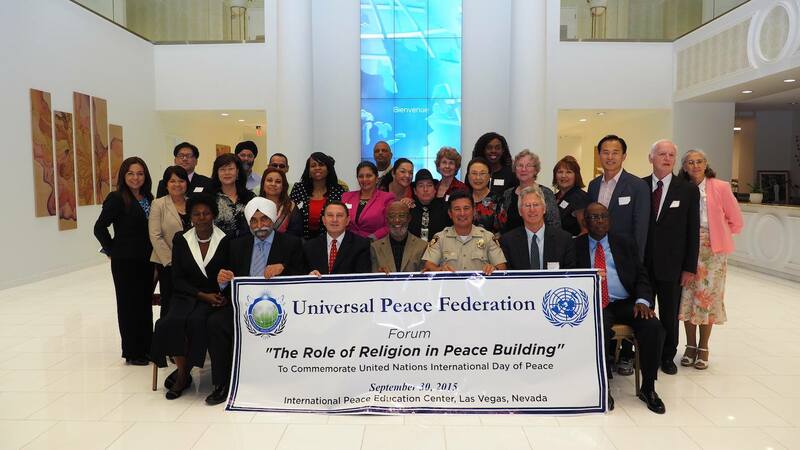 UPF LV used the occasion both to commemorate the United Nations International Day of Peace (September 21) and to respond to the UN recommendations dealing with policing in communities across America. True Father, the founder of UPF, taught that the best way to resolve conflict is not by force or power but by learning to love one another. UPF-USA Secretary General Ricardo de Sena showed a short film about UPF and gave an introduction to the UPF Principles of Peace. A lively panel discussion followed and included comments from the Deputy Chief of Police Gary Schofield, the honorable Imam Mujahid Ramadan of the Sheriff’s Council of African-American Affairs, the Rev. 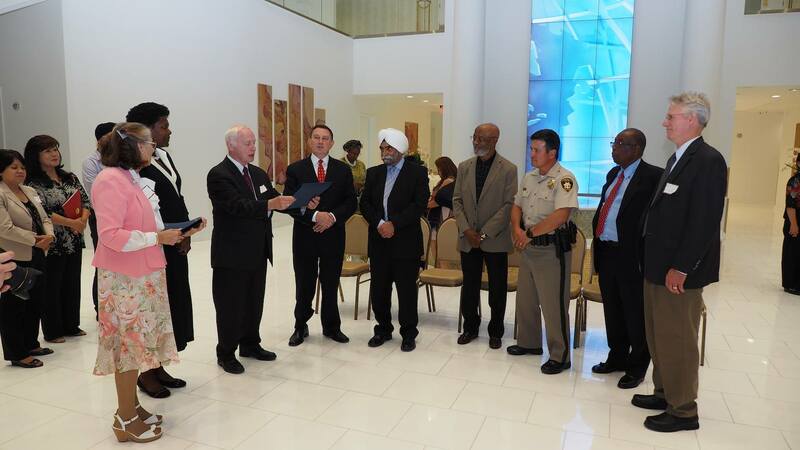 Andrew Compton of the Family Federation for World Peace of Las Vegas, and Dr. Taji Malik, a member of the Mayor’s Southern Nevada Interfaith Council representing Sikhism. Among the topics discussed were the current conditions in the African-American community in the United States. According to Imam Ramadan, current difficult and distrustful conditions in the modern African-American community have their roots in the time in U.S. history before slavery was abolished, when police hunted down runaway slaves. Deputy Chief Schofield mentioned his concern over the lack of heartfelt caring for human life from the Las Vegas community at large. Dr. Malik said that “people need to be educated about each other’s religious beliefs and customs,” while Rev. Compton encouraged a discussion on the topic of marriage and the family. It was a very exciting and educational forum, and the panelists and audience were amazed at the great outpouring of ideas and feeling of unity. At the conclusion of the event Katherine Duncan, the chair of UPF LV, presented each of the panelists with an Ambassador for Peace certificate. They unanimously indicated that they were anxious to work with and invite UPF to their interfaith and community action committees. All were very excited to have been part of this first UPF panel discussion at the International Peace Education Center. The consensus among the participants was that a peaceful family is the foundation for a peaceful society, nation and world. All were encouraged to attend the World Peace Blessing, which was held on October 3 at the International Peace Education Center.